By the time we reached our hotel after returning from whitewater rafting, it was already 8.30pm and KampungboyCitygal was waiting for us for dinner. 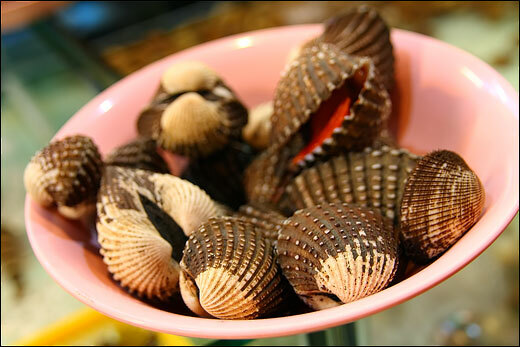 Not sure where to go, we asked Lavender Lodge’s owner to recommend us some seafood restaurants which the locals usually patronize. And Salut, Luyang and Gayang were suggested. After considering time and cost factor, we decided to give Luyang Seafood Restaurant at Luyang (yes, the restaurant has the same name as the location) a try because it was the nearest and also the cheapest via taxi (RM12). 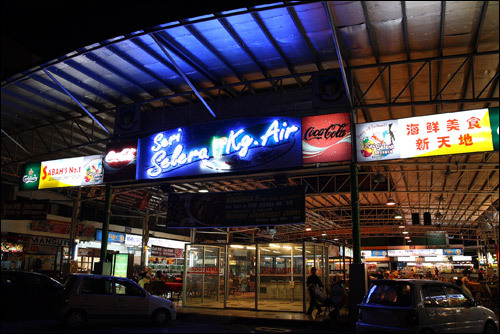 Other places like Salut and Gayang would have taken at least 40 minutes to reach and the taxi wanted to charge us a whopping RM120! I think we were unlucky to reach at Luyang quite late because most of the seafood like prawns and clams were finished. Not even a single clam or prawn was left lol. 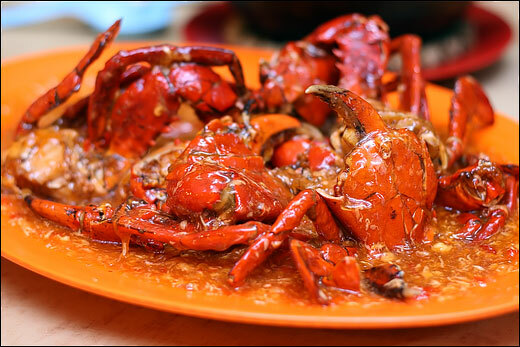 We were only left with fish and crab, which Luyang Restaurant was famous for. 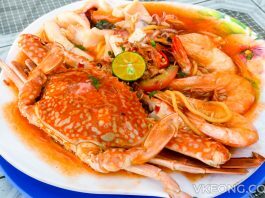 Our first dish was Spicy and Sour Crabs @ RM28/kg for the female mud crabs. I had quite high expectation in this dish actually, since it was supposed to be Luyang’s signature dish. Looks wise it was already a winner but I felt it the crabs weren’t anywhere spectacular. 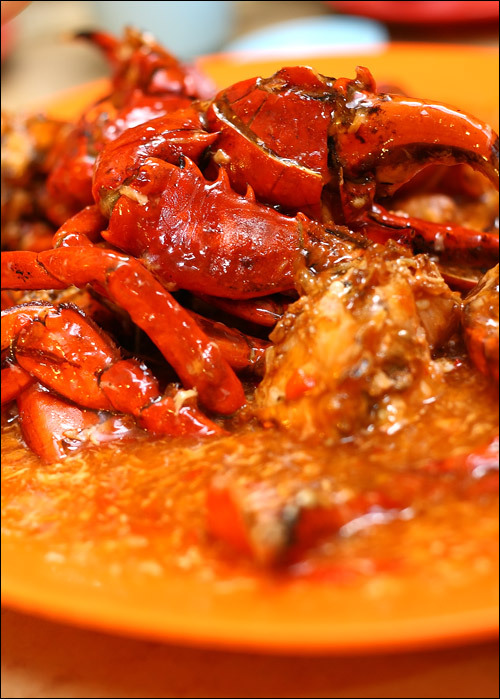 The gravy, initially quite tasty turned jelly like after being left cold and the crab meats always stuck to the shell, making the peeling even more difficult. At one point we were so frustrated with all the hard work peeling the crabs (and so little flesh!) we wanted to stop eating altogether lol. 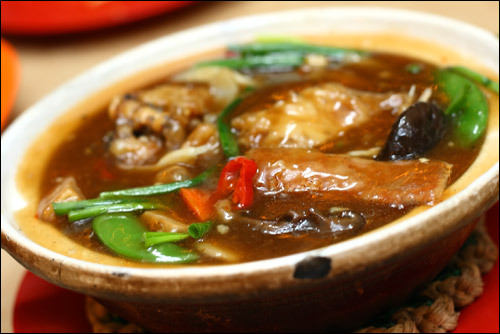 After a disappointing first dish, things started to look up with the arrival of Braised Garoupa in Claypot – RM25 if not mistaken. The Garoupa was meaty and flavorful, really nice especially when it was still warm. Since we ran out of seafood to order, we decided to give the Spicy Sour Noodle @ RM6 a try. Besides being a highly recommended noodle by the restaurant, most of the tables ordered it too. So, we figured it should be worth a try. It was a worthy try alright and surprisingly the noodle turned out to be the dish I enjoyed the most. 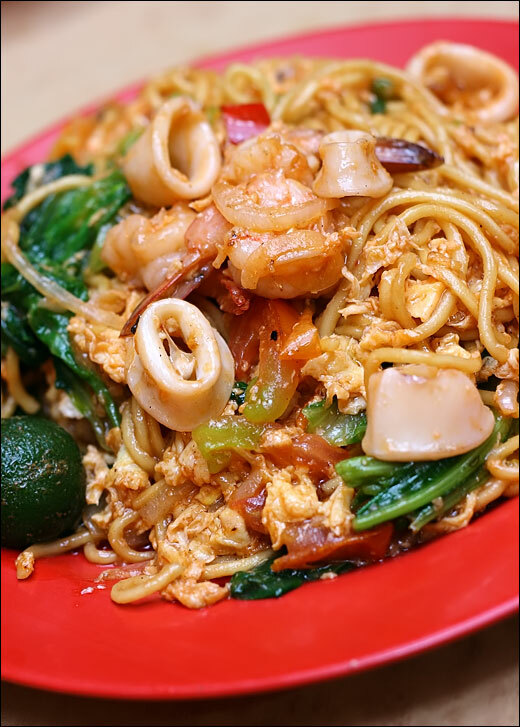 The taste closely resembles the Mee Jawa Goreng back in my hometown but a lot more appetizing (due to the slight sourness) and had lots of seafood! 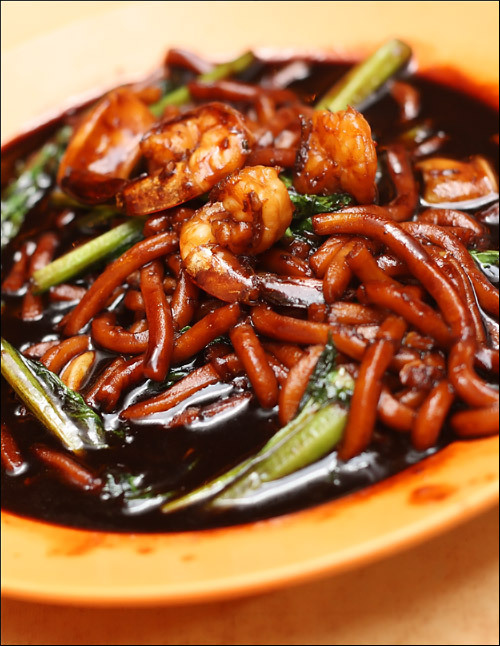 We were so impressed with the Spicy Sour Noodle that we also tried Luyang’s Fuk Kin Min (Hokkien Mee) @ RM5 – to see how how Kota Kinabalu’s would fare against the KL version. Glad to say it was fried pretty damn good (good wok hei, very fragrant) and it could easily match those in KL. Feeling rather unsatisfied due to the fact that we didn’t have any clams and prawns, we headed to Kampung Air food court opposite our hotel for a second round of seafood. 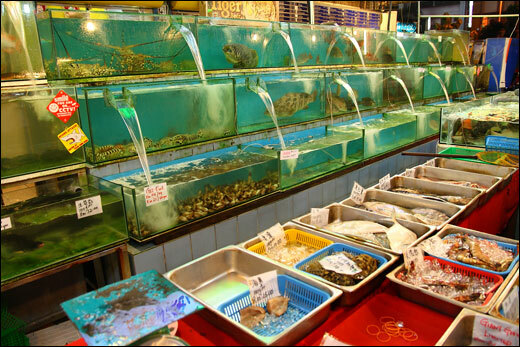 With up to 5 seafood restaurants in this huge food court alone, live seafood selection is vast – it’s quite impossible to run out of seafood here. 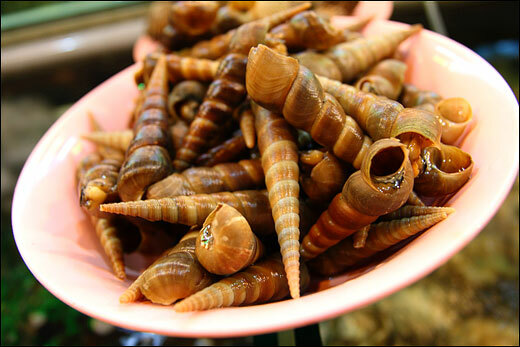 After surveying all the restaurants we chose Old Village Restaurant because their Tong Fong Lo snail and Elephant Trunk clam were the cheapest around. 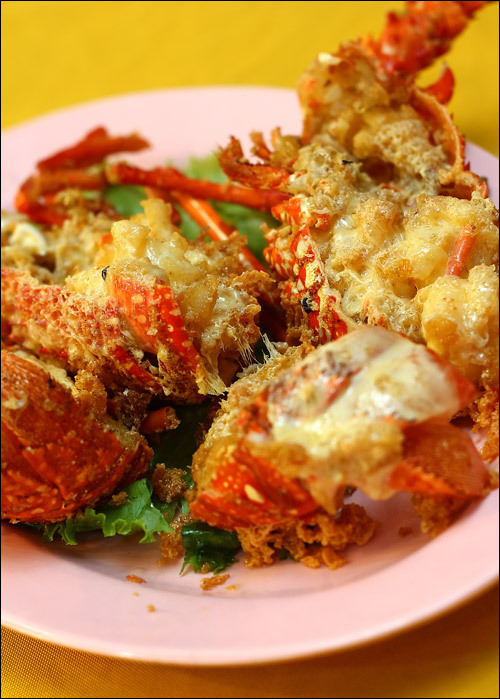 Plus, they had a lobster promotion going on – RM10 per 100g. 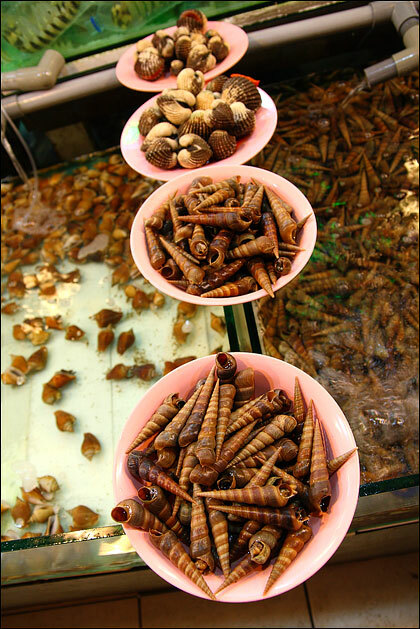 Before I show you the food we had, lets take a closer look at some of the seafood they had. 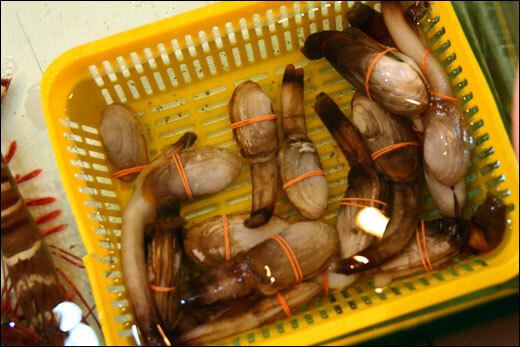 象拔蚌 – Elephant Trunk Clams, or Geoduck that can shoot water from their ‘trunks’. Quite shocked to see that when the owner picked up one of them lol. Our lobster, which weighed at 600 grams. 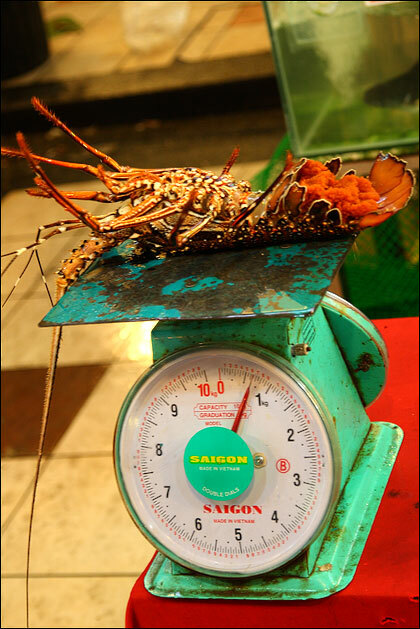 You know what, each of us took turns taking a photo with the lobster after it was weighed. Hey, it’s not often you get to order lobster and even get to pose with it too ok lol. Cheese Baked Lobster @ RM60. Although the lobster was pretty small sized it still packed quite a lot of succulent, sweet tasting flesh. Marvelous. The presentation could have been better though, I myself wouldn’t have guessed it was lobster just by looking at it. Half a kg of steamed 东风螺 Tong Fong Lo @ RM15. 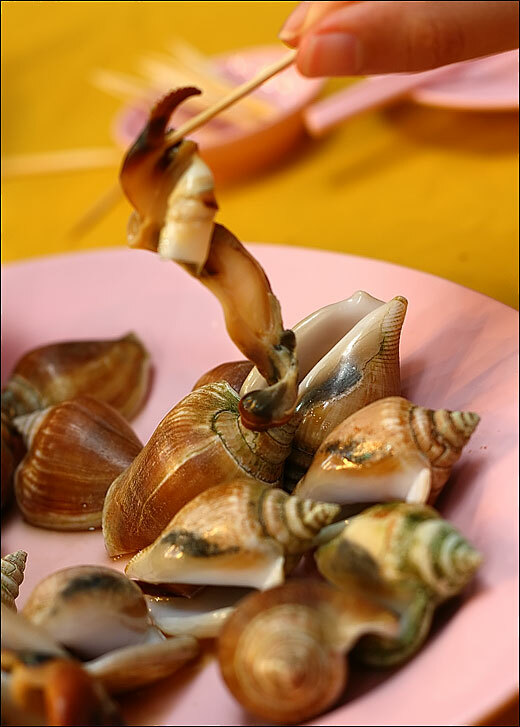 The only way to get to the snails’ flesh was to use a toothpick is skewer the bodies out of the shells. 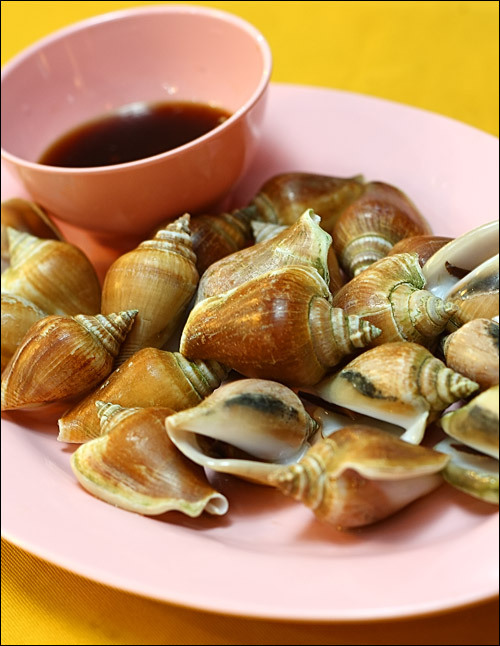 The snails were pretty much tasteless so dipping sauce was required for the much needed flavor. 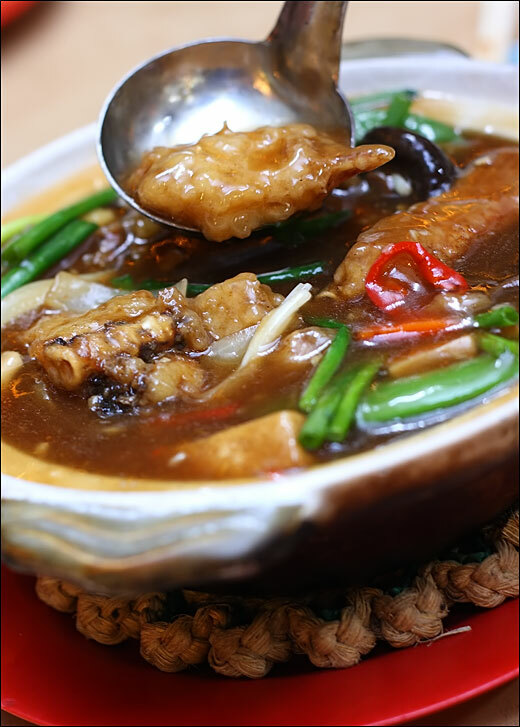 If you are easily turned off by pungent fishy smell, you ought to avoid this dish because the smell was there and pretty strong too. 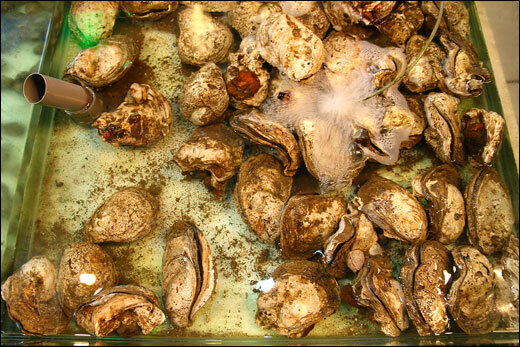 And some of the snails were still raw so we had to send them back to be steamed longer. Overall not very happy with it. Lastly, Garlic Steamed Elephant Trunk Clams @ RM20 (1/2 kg) They sure don’t look as long as they did when they were still alive though, with their ‘trunks’ removed and shrunk a lot in size as well. 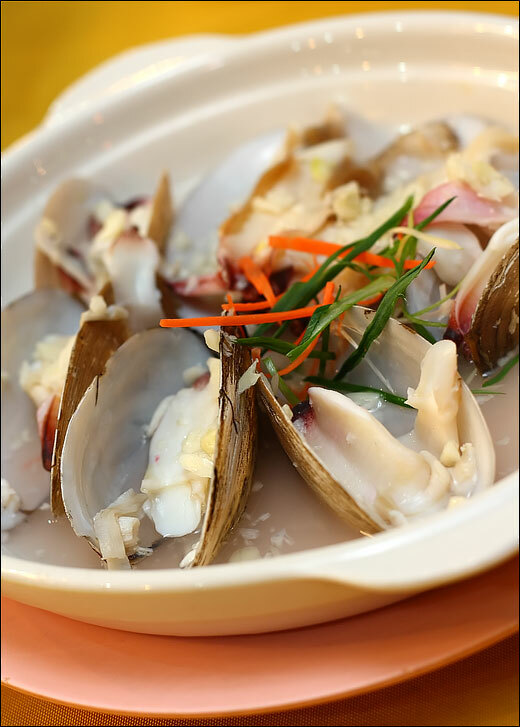 Albeit a little chewy, the clams were quite enjoyable for the freshness. 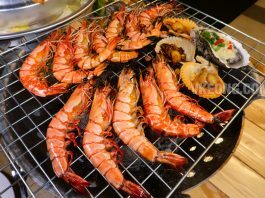 Wow, I am really amazed looking at the amount of seafood we had for dinner alone that day! Either we are really gluttons, or we were just too tired it made us hungrier than usual. But I am pretty sure it’s the former, lol.